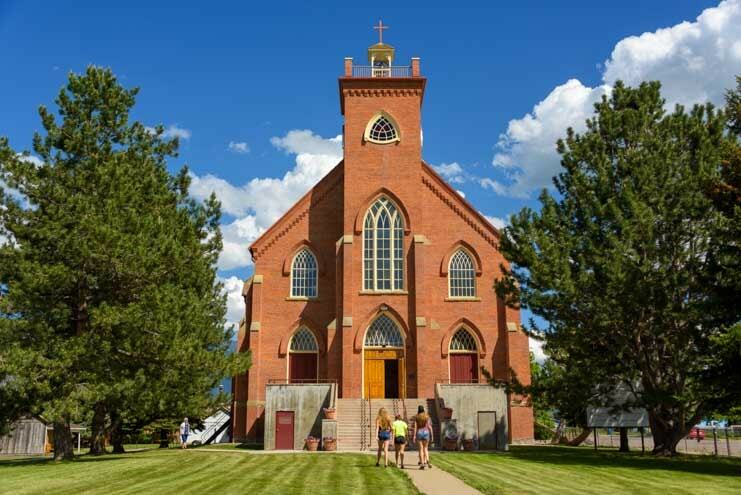 Montana Road Trip – Wildflowers, Bison, a Mission Church + Good Eats! 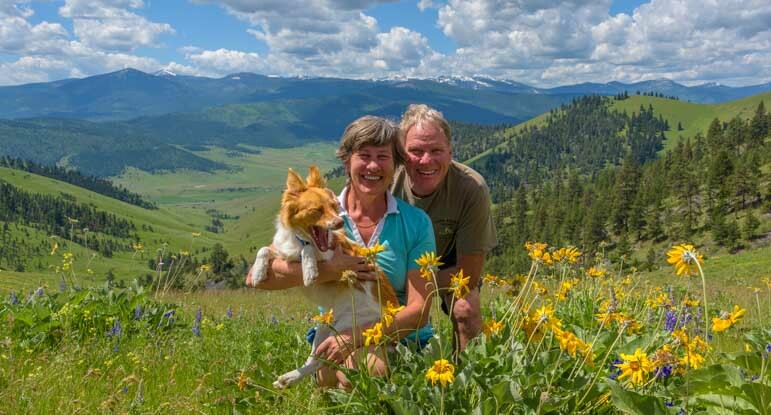 June 2018 – We recently visited our friends Bob and Donna Lea in western Montana, and they took us on a wonderful daylong road trip into the wildflowers and mountains that lie between Missoula and Flathead Lake. 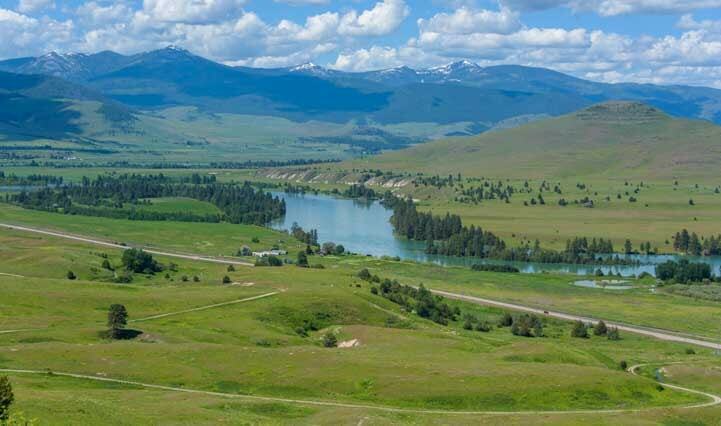 We saw some wonderful pastoral scenery on a day trip in western Montana. 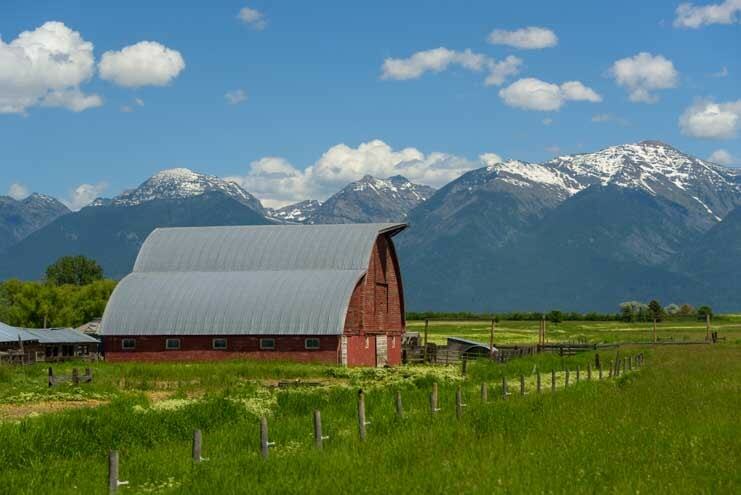 The scenery on the drive was delightful, with snow capped mountains and pretty farms dotting the landscape. 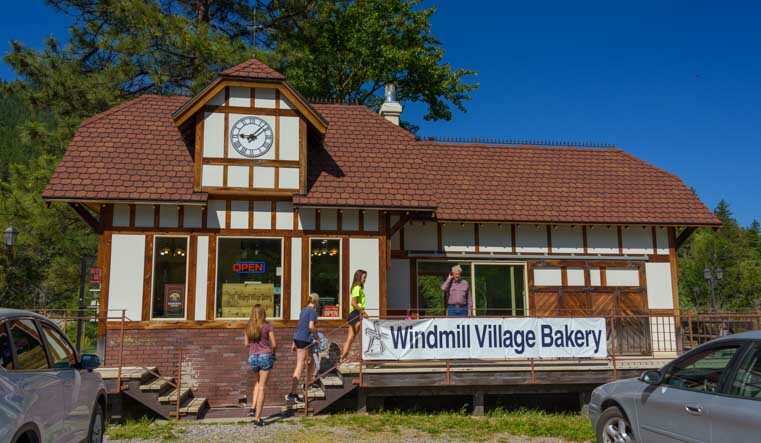 After we’d drive on lovely back roads for a little while, we pulled into the Windmill Village Bakery in Ravalli for a cup of coffee and some freshly made pastries. Windmill Village Bakery is known for fresh made donuts. 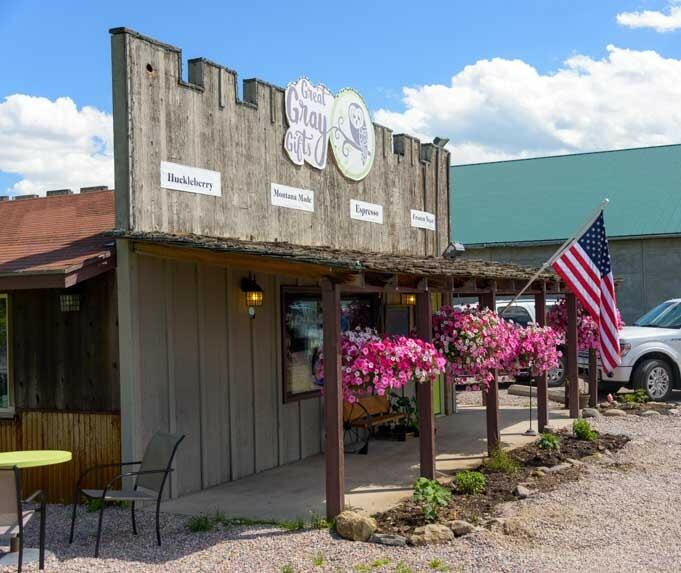 This cute little roadside bakery is known for its fresh donuts, which are made right behind the counter, and for its beautiful patio that overlooks a small pond and windmill. Out back there is a patio overlooking a pond with a windmill. With our tummies happily full, we made our way to the National Bison Range. 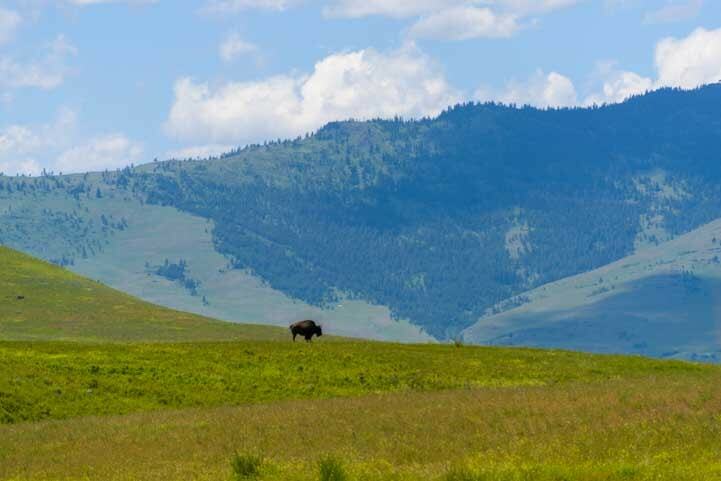 Managed by the US Fish & Wildlife Service, this land is part of the National Wildlife Refuge System and is a refuge for 350-500 buffalo that was established by President Theodore Roosevelt in 1908. The National Bison Range has buffalo and a whole lot more! Other animals also call the refuge home, and when we arrived we saw an enormous stack of elk antlers. Elk naturally shed their antlers each year, and these antlers were collected at the range. 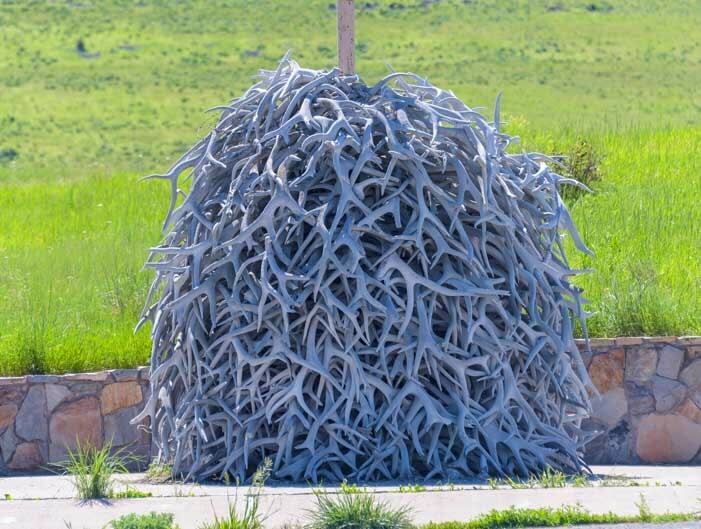 A pile of shed elk antlers greeted us at the Visitors Center. 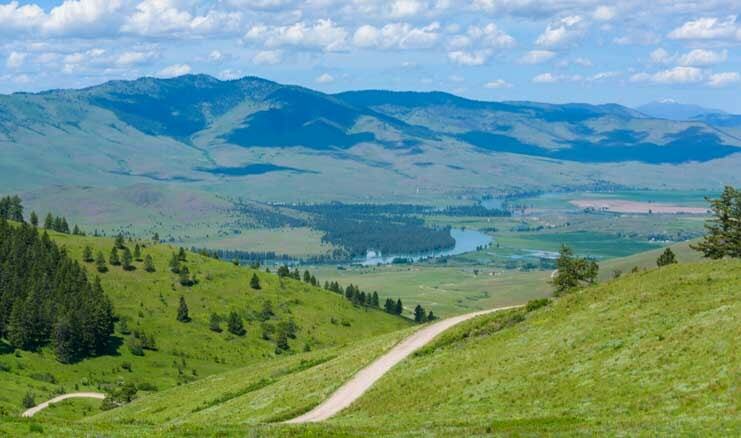 There is a loop drive that meanders through the refuge, and as we drove into the park we climbed quite high up in the hills and had a great view of the Flathead River. 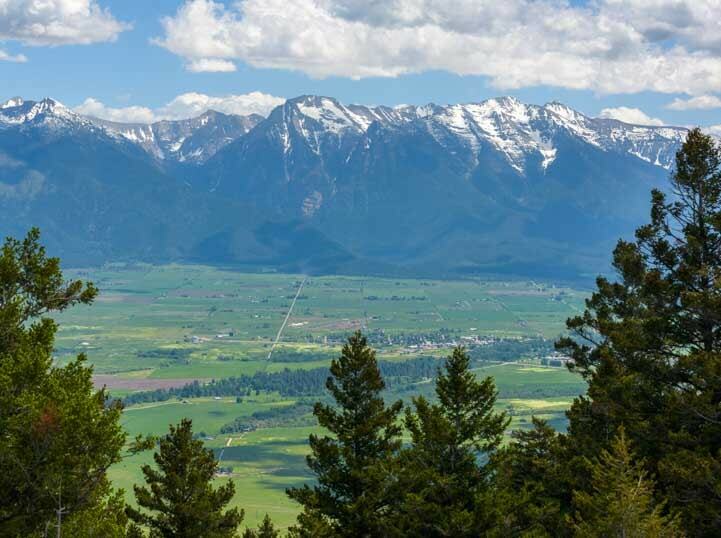 The loop drive took us high up for a view of the Flathead River. The scenic drive is a gravel road, but it is easy to drive in a passenger car. The ribbon of road is gravel and easily driven. We arrived just after the peak of wildflower season, but there were still lots of beautiful flowers in bloom blanketing the hillsides. 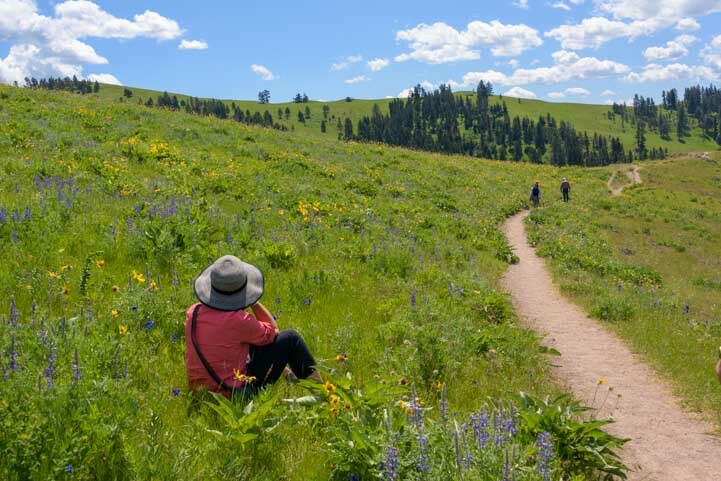 We walked on a trail through the vast beds of flowers and spotted some wild photographers sitting among them! 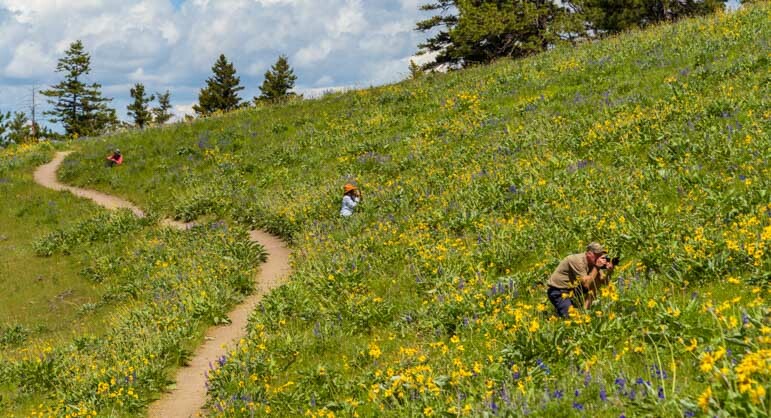 Photographers were enjoying quiet moments with the wildflowers. 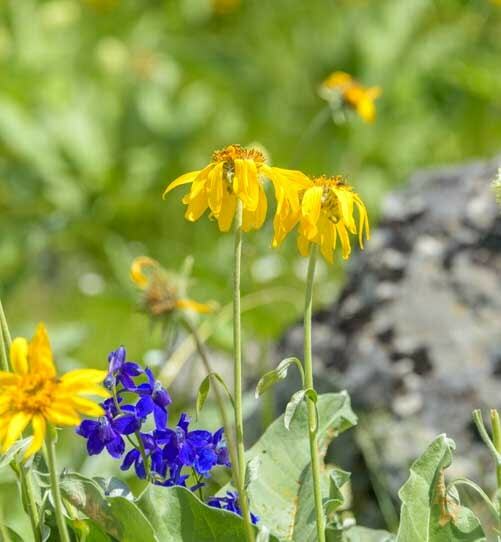 The peak for wildflowers in the BIson Range is mid-May but they were still lovely two weeks later. The flowers were so thick and so colorful that we vowed we will return another year to experience this place during the peak in mid-May. Of course, flowers don’t follow the Gregorian Calendar too closely, so we’ll call ahead to see how the flowers are doing before visiting! 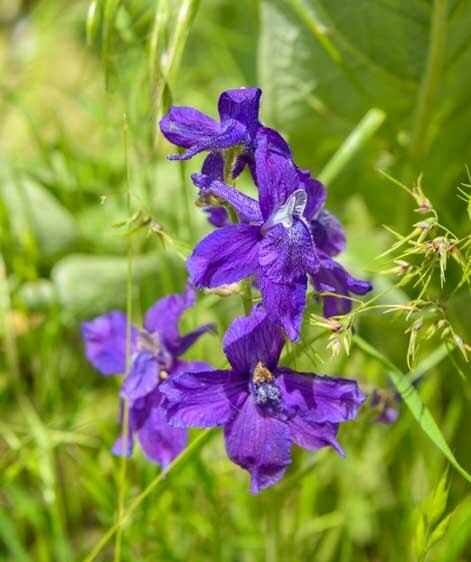 As we were strolling and crouching between the flowers to get their pics, Bob pointed out the Bitterroot flower. 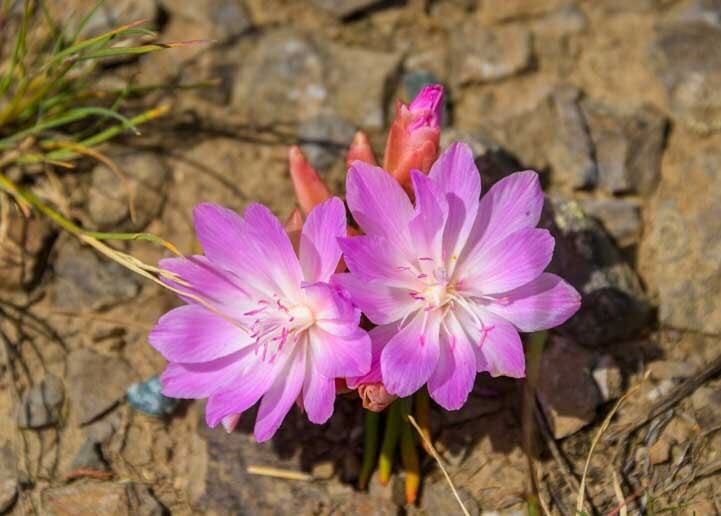 This beautiful pink flower is the namesake of the Bitterroot Valley. 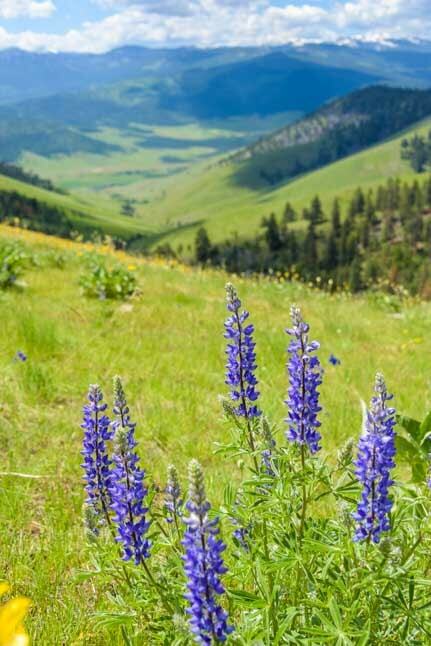 Bitterroot flowers used to be very common in Montana’s Bitterroot Valley! This seemed like a fantastic place to get a selfie. Of course, nowadays our selfies include a certain furry person, and sometimes it takes more than one shot to get it right. In the first pic he let out a big yawn. Luckily we got another! What a great spot for a selfie. Oops, Buddy was yawning! 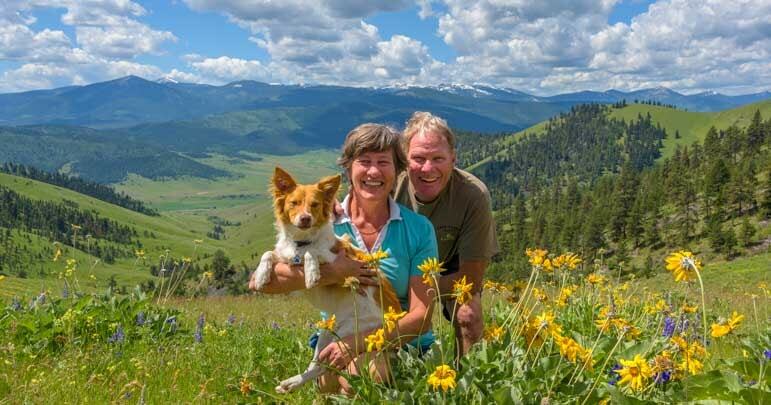 Montana had a ton of snow this past winter and loads of rain in the spring too, so the rolling hills were lush and green. 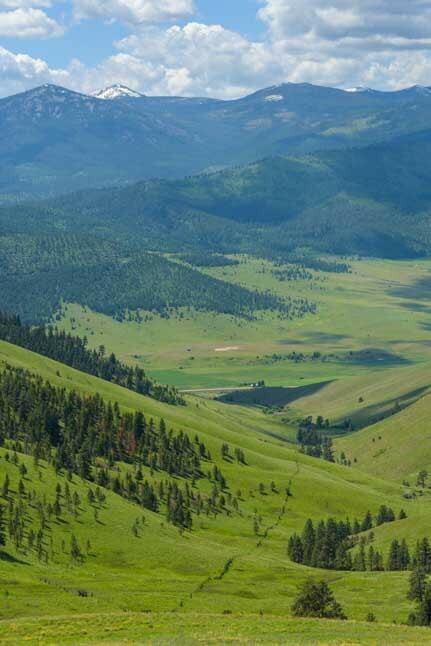 Rolling green hills of Montana. We were very surprised to learn that the very flat valley below us was once the bottom of a huge lake that reached from the mountains we were standing on to the mountains in the distance. At one time a lake filled the valley between the mountains. Just like driving through parts of Arizona and Utah that were once covered with an inland sea where you feel like you are driving on the bottom of an ocean with tall islands sticking up around you, it was easy to imagine a huge glacial lake with waves lapping the sides of these mountains. The lake came up about two-thirds of the height of the mountains. Looking down at the ancient lake bottom. We had been enjoying the wildflowers and the beautiful views, but the buffalo herd was apparently on break that day. We did see two sauntering by the car at one point but couldn’t get our cameras going fast enough to get a photo. However, near the end of our drive we saw a lone buffalo in the distance. 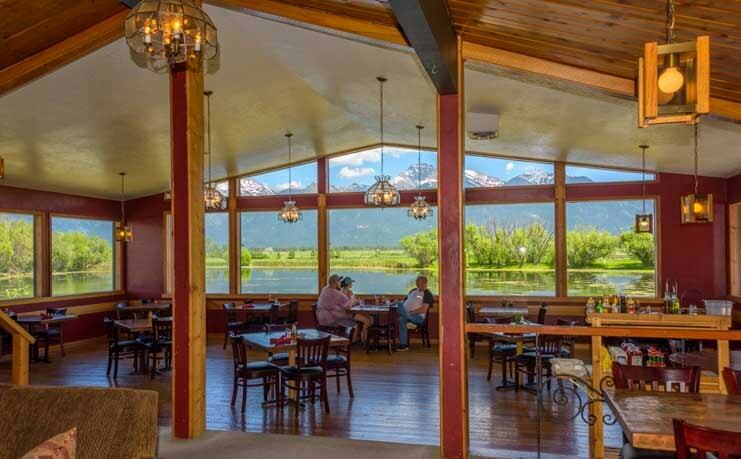 By now we were ready for another scenic snack so we stopped at the Ninepipes Lodge which has a wonderful outdoor patio overlooking a pond with mountains in the distance. We had a fabulous view for lunch from the patio at Ninepipes Lodge. There’s an indoor dining room too, but the weather was just perfect to sit outside. The fish and chips was terrific, and we got a kick out of the gift shop too! The indoor dining room was beautiful, but we liked being outside on the deck. The gift shop had lots of goodies. Our final stop for the day was at St. Ignatius Mission Church. 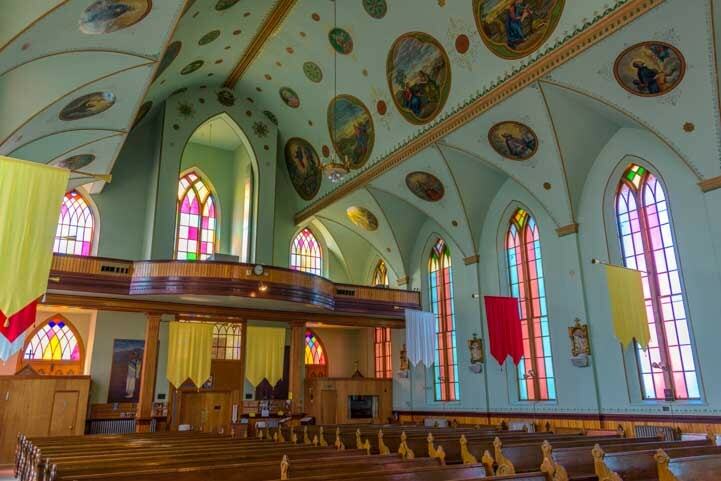 This church was built in 1891. 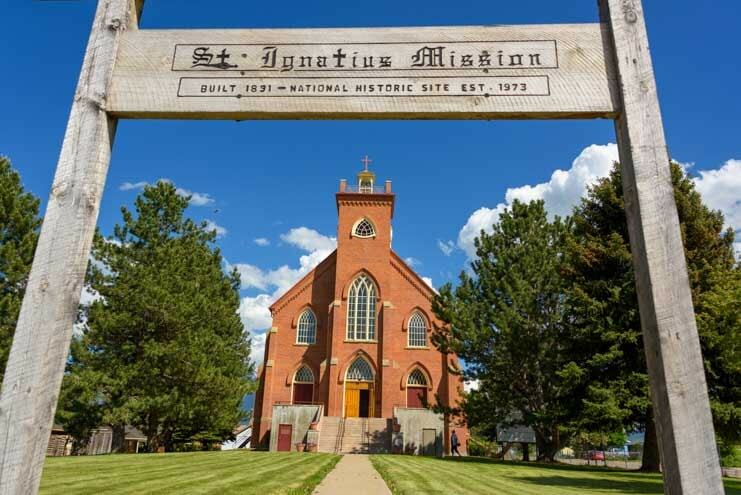 St. Ignatius Mission was built in 1891. 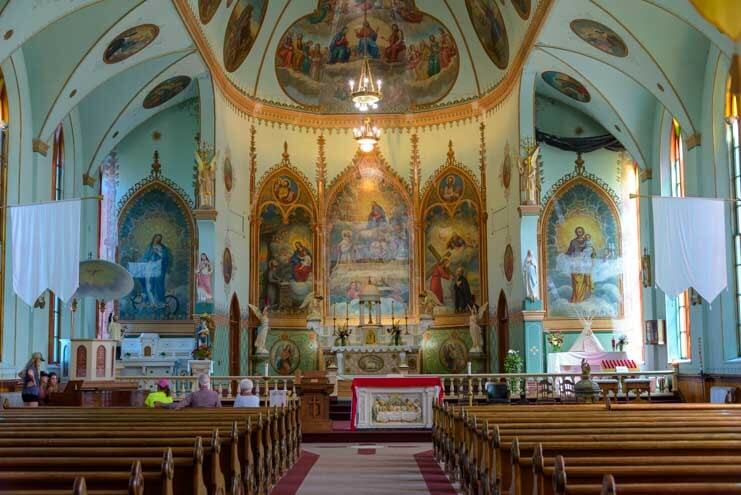 We explored the pretty interior of this Catholic church. 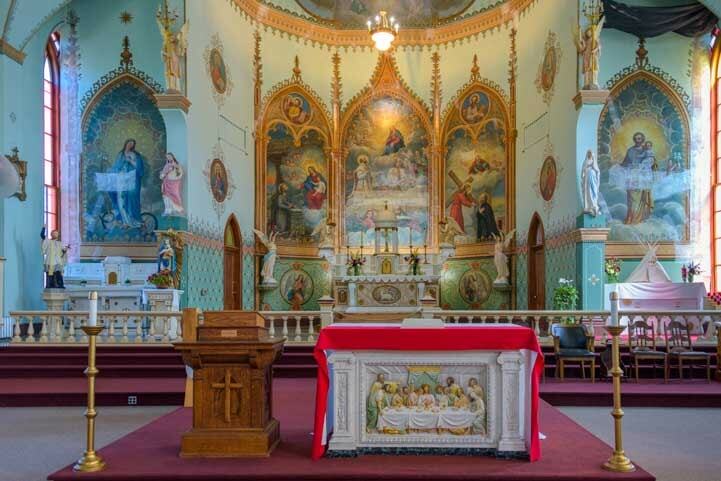 The mission is very ornate inside with elaborate paintings on every nook and cranny. 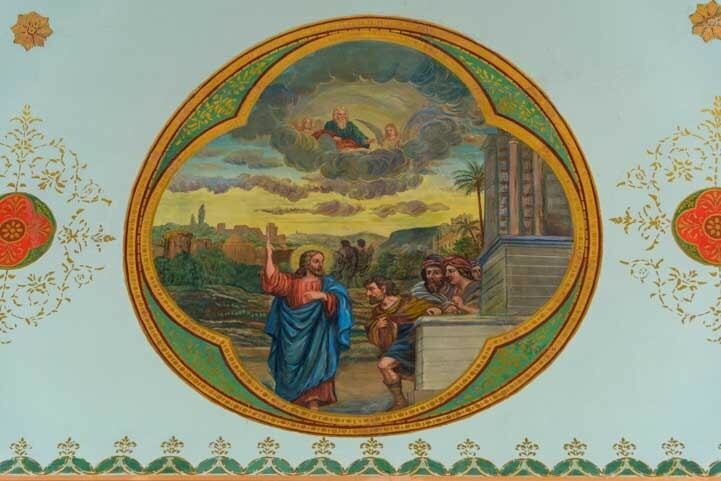 There are 58 paintings in all, each one painted by Brother Joseph Carignano. 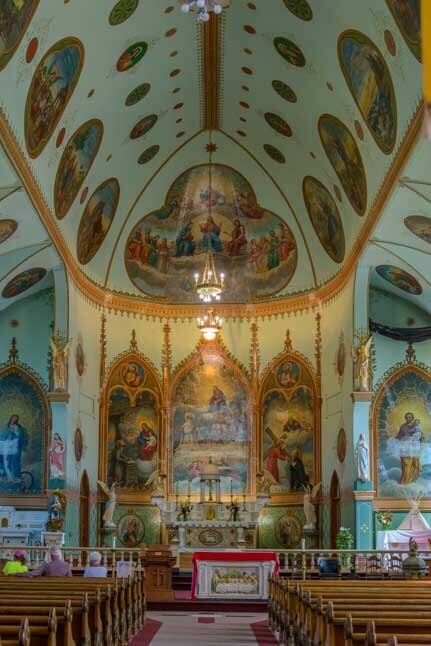 The church walls are decorated with 58 different paintings. Church services are still offered here. The paintings have been meticulously restored and are vibrant and colorful. Almost all the paintings have been lovingly restored. Just a few remain to be done. 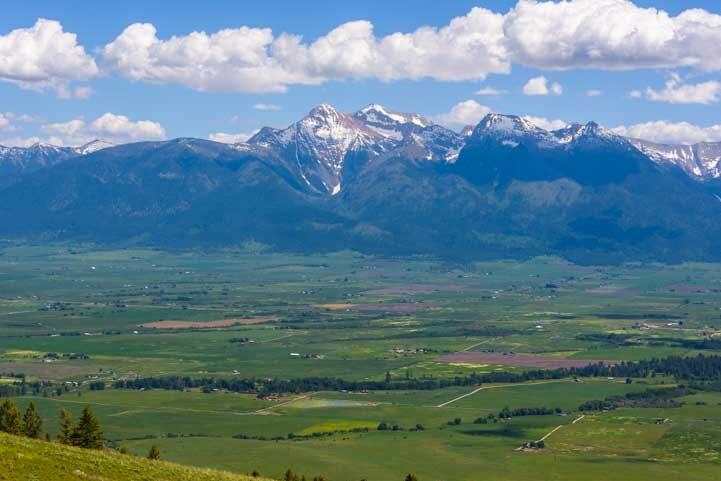 If you are taking your RV to Montana and are looking for a scenic drive with some unique places to see that are not necessarily the headliners in the tourist literature, the National Bison Range and St. Ignatius Mission are well worth a visit, and you’ll find tasty eats in a beautiful setting at both the Windmill Village Bakery and at the Ninepipes Lodge! What a beautiful day in a pretty state! 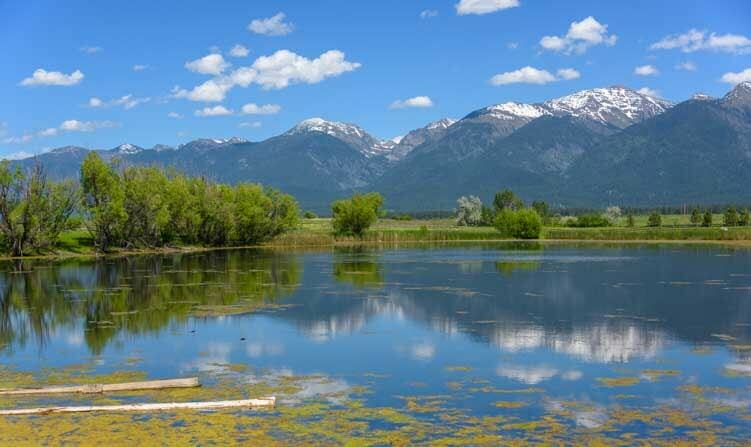 This entry was posted in Montana and tagged Back Roads RV Trips, Montana, New, Travel, USA, WP Travel by Roads Less Traveled. Bookmark the permalink. beautiful shots of the flowers, and what a beautiful church. I loved those snow capped mountains too. Tell Buddy he needs to pay attention when the cameras are running! Love the “family portrait,” Emily! So, you and Mark are responsible for the addition of another item to our Bucket List. 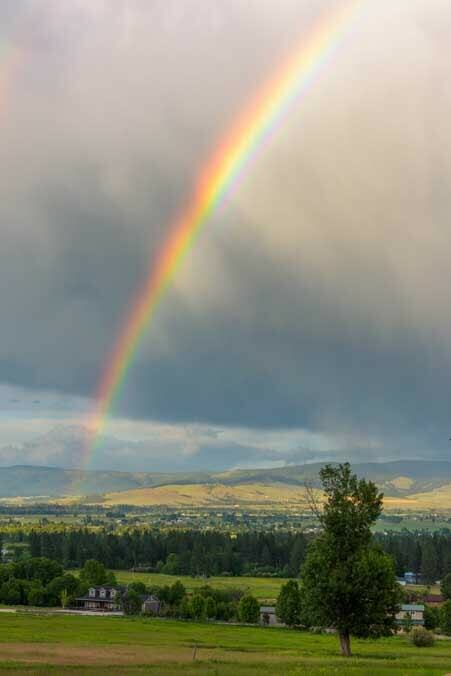 The serenity of Ninepipes Lodge is evident in your photos and the scenery is certainly magnificent. At least one meal on the patio of their dining room is now a “must do” for us. Alan rolls his eyes every time I tell him I added a new destination to our Bucket List of travel adventures, but he always smiles and he never says no. Gotta love that! We visited the National Bison Range on our honeymoon over 35 years ago. We were blessed in that we did see a large herd of bison, and we made it across the cattle grate and through the gate before they got too close for comfort. Not so for the car behind us. We could see the woman screaming as the bison surrounded their car while grazing. We waited to talk to them when they came out – the wife looked like she had been put through a wringer and the husband was grinning from ear to ear. Two very different perspectives on the adventure! That’s a great story about the herd of bison, Mary. Life is truly lived between your ears, and how you react to things makes a huge difference in how fulfilling and enjoyable life is. I understand that woman’s fright, though. A herd of bison slowly approached me and Mark and our photography friend Steve Perry and his wife Rose, and I dove into the car headfirst with a scream to join her in safety while Mark and Steve hung out with their cameras and tripods taking photos until they were almost touching the bison! Too funny about your bucket list. Ours gets longer with every place we visit, so we’ve found it’s an integral part of the traveling life. Ninepipes Lodge is a sweet little spot, and the family that owns it is wonderful. It’s a great place to stop for an espresso or a full fledged meal. We actually went there three times in the last few weeks because we kept finding that it was on our itinerary to get between here and there! How cool that you saw the Bison Range 35 years ago. Gosh, I saw my first buffalo just 11 years ago, so you are way ahead of me! Enjoy your travels and your future stop at Ninepipes Lodge! Wonderful pics, Em. That little church has some amazing artwork. X2 on adding to the Bucket List. Love this post! Thanks for Sharing. Wonderful! Enjoy it when you get there!!! 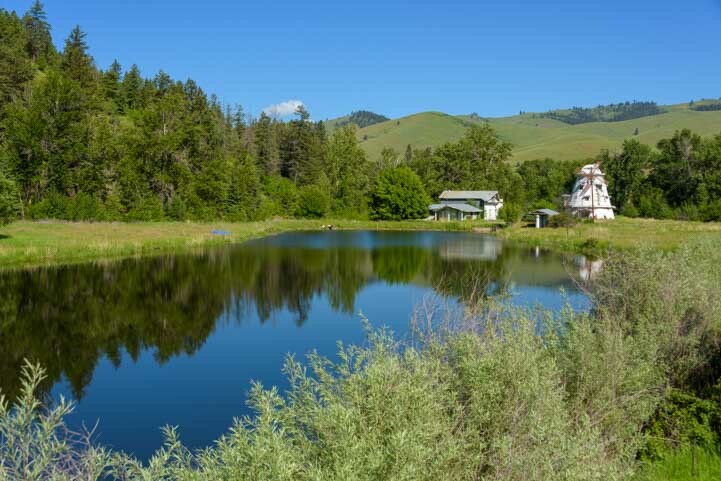 …love the shots by wild-flower-photog, Mark…and the info on the long-ago lake between the mountains…. The flowers were a lot of fun to photograph, and although the ones in this post are actually mine, Mark’s will be decorating other posts to come! The idea of an ancient lake was very intriguing, especially since a Photoshop artist had created an image that was displayed on a plaque there that showed these very mountains with a raging body of water between them. This notion of ancient lakes in Montana and ancient oceans in Utah and Arizona certainly lends a valuable longer term perspective to the concept of the planet undergoing dramatic and even cataclysmic climate and environmental changes over the course of thousands of millennia, long before people walked the earth. 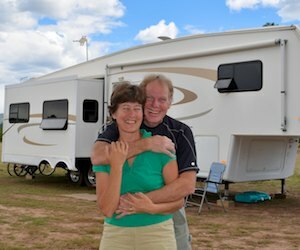 Just found your blog and love to read about your RV adventures. 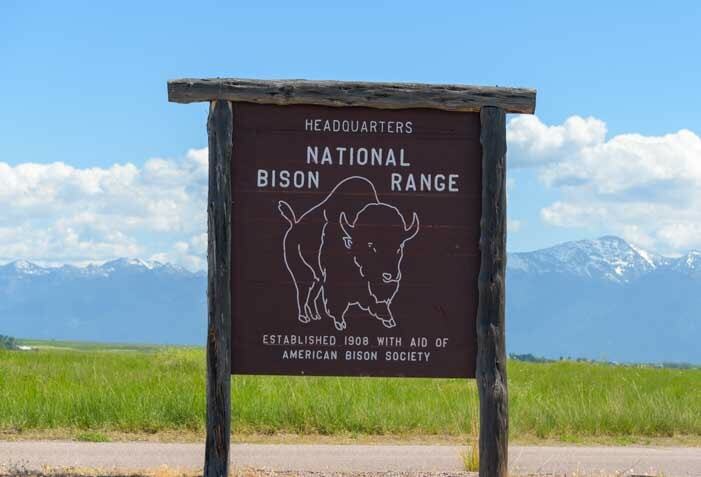 I’m currently planning a RV trip in the US and was wondering if you think it’s okay to drive a 30 feet long RV on the road through National Bison Range? It’s probably okay if you take it slow. You might contact the Bison Range directly and ask for their opinion too.